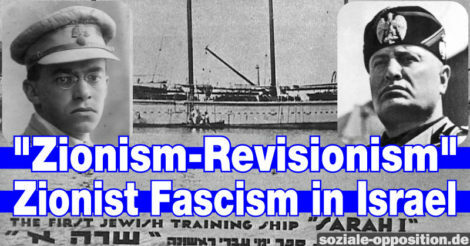 Zionist fascism – the “Zionism revisionism” from Jabotinsky and Mussolini to Netanyahu. In many countries there were fascist movements. One is reminded of Adolf Hitler in Germany, Mussolini in Italy or Francisco Franco in Spain. Even in Russia and England, there were historical figures such Lavr Kornilov and Oswald Mosley. Less well known is the Zionist fascism of Vladmir “Ze’ev” Jabotinsky. Vladmir Ze’ev Jabotinsky was a Zionist and Mussolini admirer. The tight ultra-nationalist movement of Italian fascism with jaunty marches and paramilitary uniforms impressed many nationalists in the 1930s. This was at the time not unusual – many bourgeois newspapers even in UK and the US reported positively on Mussolini. Vladimir Jabotinsky from a Jewish-atheist parents spoke fluent Italian and called himself in Italy Giacomo without being recognized a non native. He made contact with Benito Mussolini. Jabotinsky’s goal was an own movement along the lines of Italian fascism. The “Duce” was amazed and took a liking to this unexpected admirers and supported Jabotinsky. So it was that a Zionist and an avowed fascist and his organization – the “Betar” – were formed (Hebrew for “youth”) – and trained by Mussolini´s forces from 1934-1936 in the naval academy at Civitavecchia – north of Rome. The civil war in Spain and the intervention of Hitler let Mussolini looking for contact with Nazi Germany – and knowing of Hitlers antisemitism Mussloni finished the support of the “Jew” Jabotinsky. In 1923 Jabotinsky had written the “Iron Wall doctrine”, stating that only an “Iron Wall” of Zionist soldiers the native Arabs (Palestinians) to abandon their homes. The doctrine stood in contradiction to peaceful land purchase. Fellow zionists considered Jabotinsky whether this doctrine early as racist and his fascist organization – the Betar – earned him the nickname “Vladmir Hitler”. Two years military drills and other fascist indoctrination had Jabotinsky became a leader, Not was he only called by his fellow zionists whether his radical destruction will “Vladmir Hitler”, but who also acted like that. With his Betar he cofounded the Haganah, but it was not extreme enough and founding of the terrorist organization Irgun – a kind of Zionist Waffen SS – The Irgun committed acts of genocide. The explicitly Arab resistance not supporting village – Deir Yassin – was 1948 massacred. The zionist-fascists threw hand grenades into the houses and shot the fleeing men, women and children. According Irgun of about 600 inhabitants 254th were killed. The Irgun then threatened other villages with genocide. This triggered the mass flight of Palestinians – the Nakba. This policy of ethnic cleansing by Zionist fascists led directly to the founding of the State of Israel. With the establishment of Israel the once illegal racist terrorist organization Irgun – a kind of Waffen SS Zionazismus – became a party – the Herut. Heartless Jabotinsky had died on 4 August 1940 from a heart attack while visiting a military camp of Betar near New York. His successor and the new leader of the Irgun was his protégé Menachem Begin, who founded in 1944 the Herut party. Albert Einstein, Hannah Arendt and 26 other Jewish intellectuals wrote during the visit of the United States by Menachem Begin an open letter to the New York Times with the call to politicians and the public “not to support the latest manifestation of fascism”. From the “Zionist revisionist” fascist Irgun emerged the Herut Party. The Herut than merged with other right-wing organizations to become Israel-ruling party alliance Likut. The leader of Israel is Benjamin Netanyahu. He is the son of Benzion Netanyahu, who was the secretary of Jabotinsky. Benjamin Netanyahu is the notorious for its racism and SS-like massacre of the indigenous leader of today’s national-Zionist colonial regime in Palestine. The words of Albert Einstein, Hannah Arendt and many other Jewish intellectuals “not to support the latest manifestation of fascism” are still valid!